Radical Sasquatch Dumpling Company Food Truck services the Denver metro area specializing in the world wide culinary phenomena known as the dumpling. Dumplings are found throughout the world in various shapes, sizes and textures and combines a delightful flavor profile into a few bites. They range from sweet to savory, steamed to fried, chewy to crunchy and everything in between. Countless cultures have developed their own styles of these brilliant and satisfying pockets of filled dough. 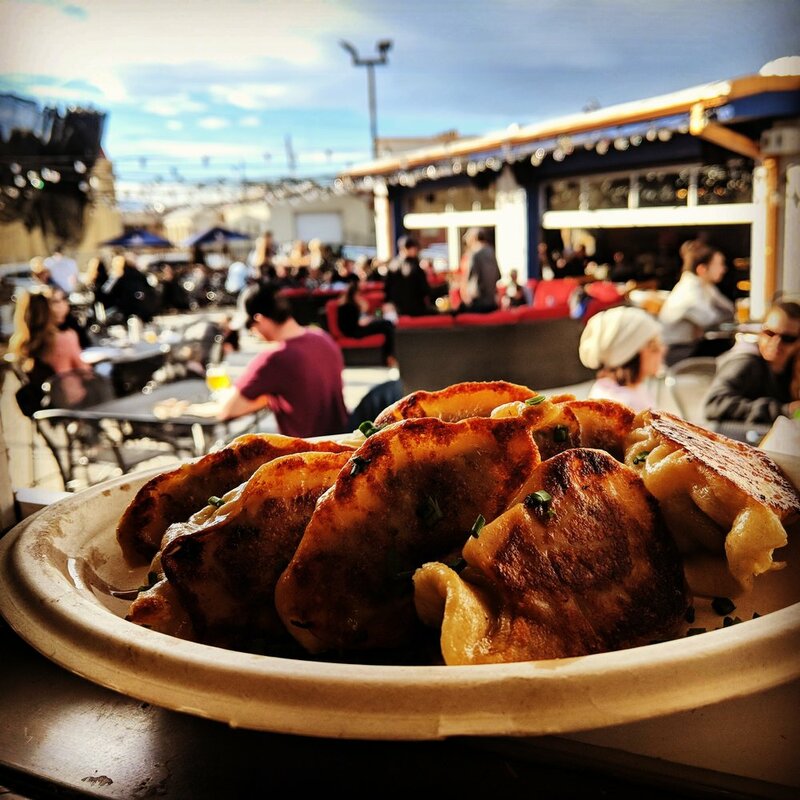 Matt Faurot and Lucas Doverspike started Radical Sasquatch Dumpling Company in 2017 to show people how versatile and wide ranging the dumpling can be. With so many different cultural styles and flavors to play around with, it is fun and easy to get creative with new and delicious combinations of fillings, dough and cooking methods. We hope you love and devour these amazing creations as much much as we do and remember to always, STAY RADICAL! Japanese style "pot stickers" soft and chewy, golden and crispy all in the same bite. This Polish dumpling is pan fried in butter then topped with caramelized onions, sour cream and chives. These delicious concoctions combine two American favorites. Philly cheese steak and Mac N' Cheese wrapped in a steamed bun that is pan fried on each side and served with a side of green chili cream sauce. Filled with dark meat chicken, smoked paprika onions, blue cheese crumbles and cream cheese. Deep fried and tossed in buffalo sauce to coat then sprinkled with blue cheese crumbles and chives. Served with a side of ranch. Dark meat chicken, roasted garlic, smoked paprika onions, parmesan and cream cheese on the inside. 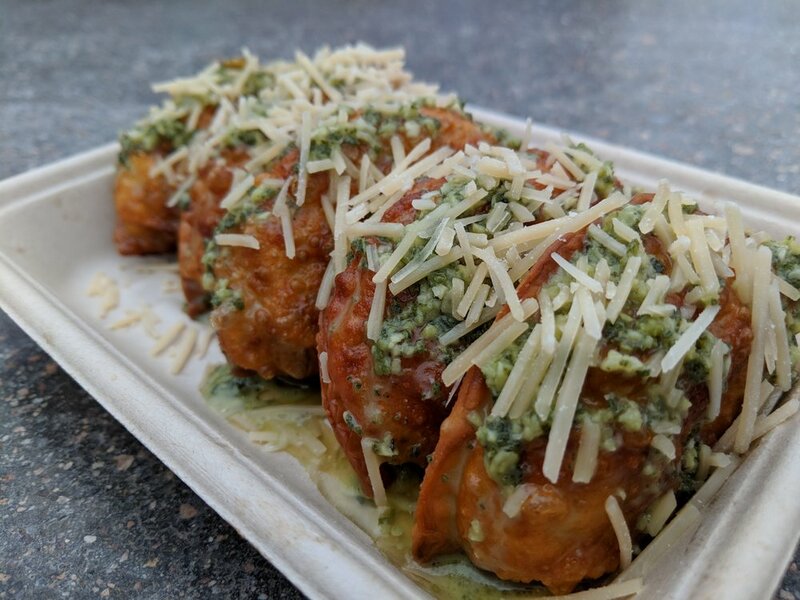 Deep fried and coated in garlic sage butter and topped with parmesan cheese. 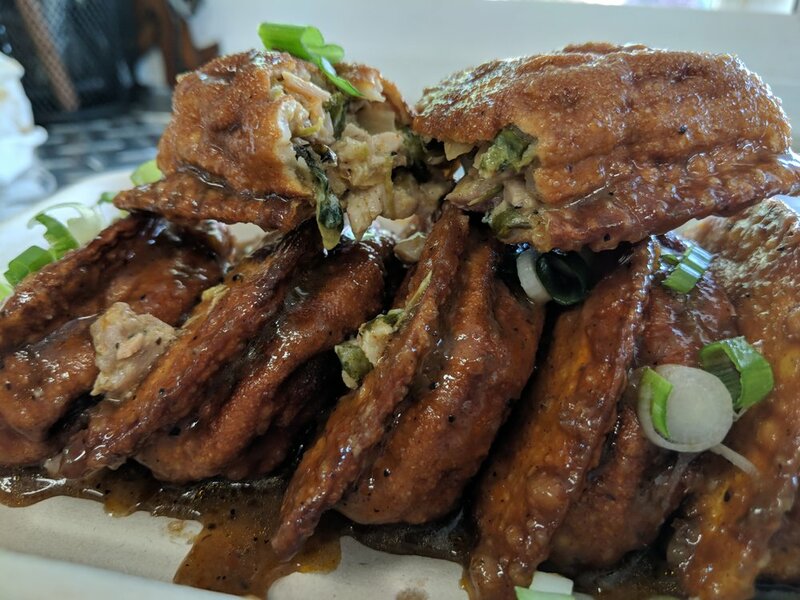 Inspired by Caribbean flavors, this dumpling is filled with dark meat chicken, roasted poblano peppers, smoked paprika onions and cream cheese then deep fried and tossed in our house made sweet and spicy jerk sauce. Garlic sage butter and parmesan cheese cover crispy golden fries. Shoestring fries drizzled with buffalo sauce and sprinkled with blue cheese crumbles. The incredible combination of our Parmesan Garlic Sage Fries and our Buffalo Fries. Garlic sage butter and buffalo sauce with parmesan and blue cheese crumbles. 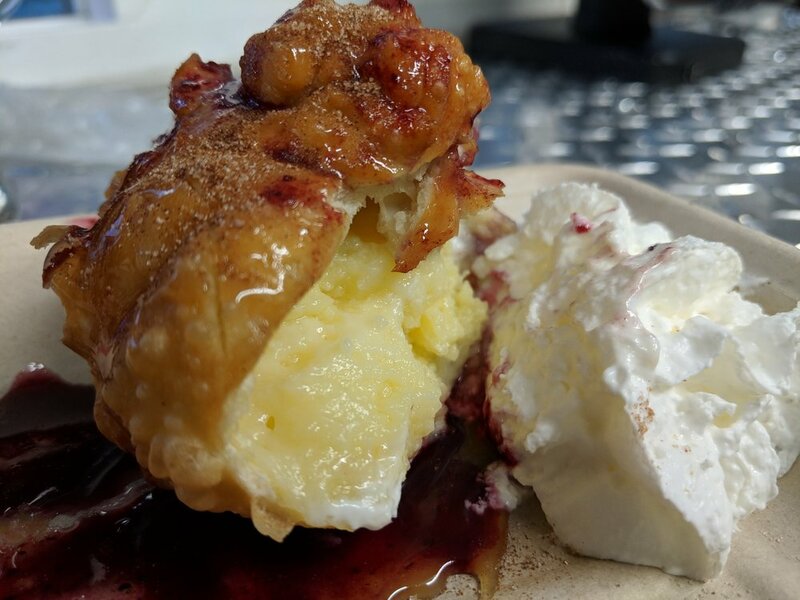 Rich cheese cake filling inside a bun that is deep fried and topped with your choice of caramel sauce, mixed berry sauce, cinnamon sugar, whipped cream or powdered sugar. Sightings and stories of large strange bipedal ape-like creatures have been occurring around the world for thousands of years and continue to this day. Known by many different names, the Sasquatch has not stopped captivating peoples imaginations and has inspired countless quests to find this elusive "cryptid". Techniques such as tree knocking, howling and "whooping" are used to lure Big Foots while motion activated game cameras are trained on bait traps in attempt to capture images of the mythological beast. All the efforts to prove the existence of the infamous Sasquatch have proved mostly fruitless with the only "evidence" being muddy foot prints, blurred images and strange sounds and occurrences in the deep wilderness. Some theories state that the lack of evidence and impossible elusiveness is due to the Sasquatch's ability to travel interdimensionally with ease leaving little to no trace. Some also believe that it has the ability to disrupt technology without physical interaction with it. While certain individuals have even claimed to have been kidnapped by Big Foot, undeniable proof of the existence of Sasquatch has yet to be produced. And so, the search continues. As Difficult as it may be to find a Sasquatch in the wild, it is far easier to locate Radical Sasquatch Dumpling Company. All you need is an internet connection and some form of transportation and you'll quickly be face to face with legendary food. Keep Searching.